For the past couple of years, I’ve been looking forward to experiencing the Newburyport Farmers Market in Newburyport, MA. I am on their e-mailing list and it always seemed like an exciting market with lots of vendors, even in the colder months. Unfortunately, it’s about 35 miles from home, a little too far for a casual Sunday drive. 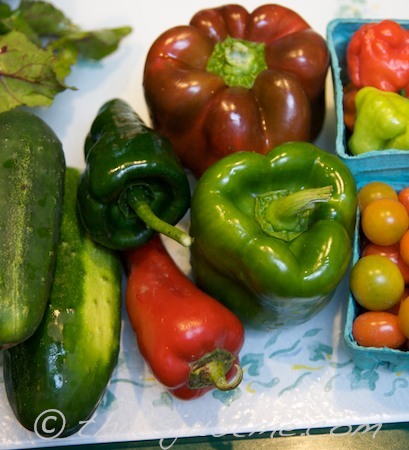 A few days ago, I was lucky enough to get my chance to visit the market on the way to visit Maine. It was incredible and I wish it was closer, as I’d be dropping by more often! Another trip to the Mahoney’s Garden Center Winter Farmers Market! Excellent selection of vegetables from 3 farms again. 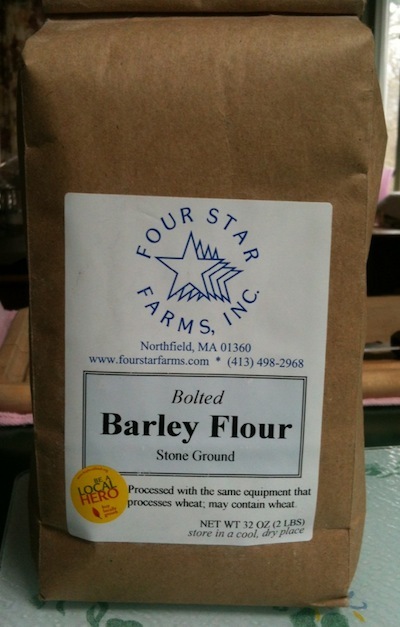 From Springbrook Farm, I purchased a 5+ pound bag of russet potatoes for $3. From Oakdale Farm, I spent $8.25 for small broccoli ($3/lb), sweet potatoes ($2/lb), beets ($1.50/lb), and a lovely cabbage head ($2 ea). I am so lucky (and blessed) to live near farms that are good enough to grow and share many wonderful vegetables with others. I finally made it to the winter farmers market at Mahoney’s Garden Center in Winchester today. It was awesome; I was very happy I ventured out in the cold! There were 3 farms, selling lots of vegetables! Per usual, I initially walked around the floor, checking out the offerings, and I decided to buy a little bit from each of them. Oakdale Farm had a great selection of root veggies: carrots, beets, onions, potatoes, and sweet potatoes, along with radishes, kale and small bags of greens. Plus I was surprised to see broccoli and brussels sprouts. 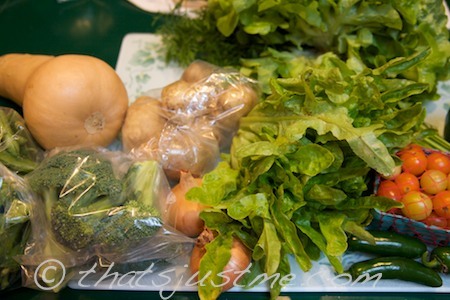 Springbrook Farm had small bags of mixed greens and spinach. Silverbrook Farm offered parsnips, carrots (massive! 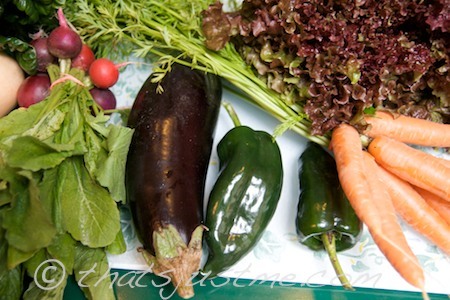 ), beets, potatoes, sweet potatoes, celeriac, turnips, kale, swiss chard, along with mixed greens and cute micro greens. I was really surprised and so happy that there really was a lot to choose from, plus prices were not outrageous for most of it. 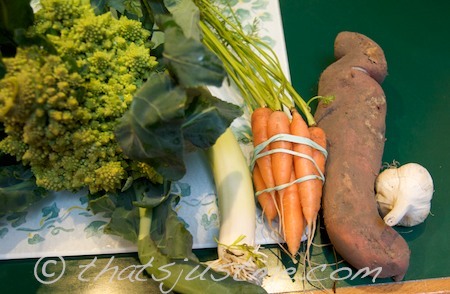 The root veggies were $1.50-$2 per pound. Oakdale farm was selling the broccoli, kale and radishes for $3 per bunch. The baby greens were pretty expensive, but that’s to be expected in New England wintertime. I paid $4.50 for about a half pound. Next time, I’m thinking maybe carrots, parsnips and radishes. 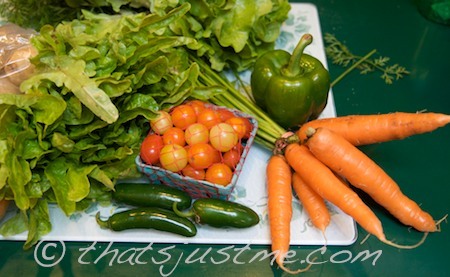 Last year, I wrote a detailed review of my first CSA season with Farmer Dave’s in Dracut MA. 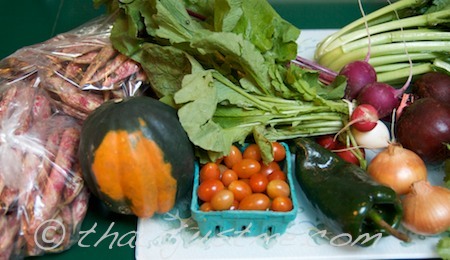 We just finished this season’s CSA and the veggies were just as plentiful and delicious! If you are new to CSA’s, please read last season’s review as it includes a lot more detail about CSA’s and their benefits. There is also information on the Farmer Dave web site. I won’t repeat too much information here, but to summarize, Farmer Dave offers small & regular sized vegetable CSA shares with pick-ups in Beverly, Burlington, Lanesville, Dracut, Lawrence, Tewksbury, Somerville, Putnam Investments (for Putnam employees only), Downtown Gloucester, Boston Medical Center, Jamaica Plain, and newly added Reading. 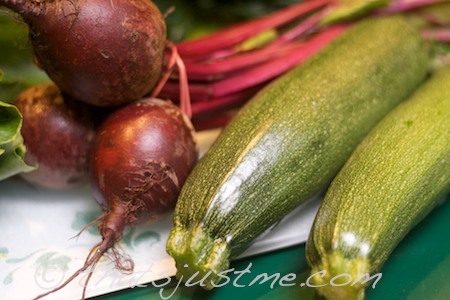 They also offer summer fruit shares, as well as late fall and early spring shares. Keep in mind, I had a “small” share. The larger shares received at least double the amounts, and depending on the pick up location, the variety could be slightly different. I originally swapped the tendrils for more lettuce, but as I left I decided to go back and grab them back. Why shy away from something different and cool! They are tiny little flowers and lots of green stems leaves and tiny squiggly bits. 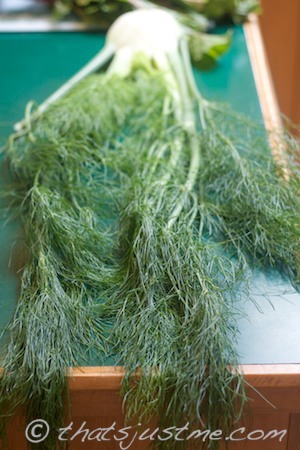 Fennel (with extremely long fronds over 2 ft I think), Beets (or choice of radishes or turnips), Tatsoi (swapped for more beets), Gorgeous kale, Gorgeous chard, Red leaf lettuce, Spinach, Shelling Peas, Garlic scapes. 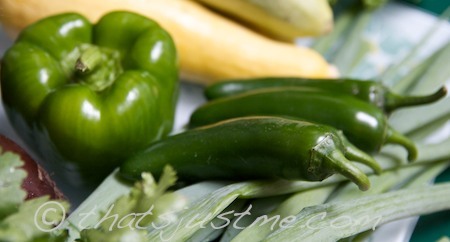 I love me some Jalepeno Peppers! 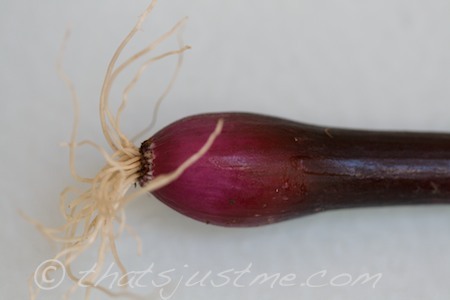 I love larger sized scallions, and I love purple scallions even more! This week we received a huge delivery! 3 heavy bags full! 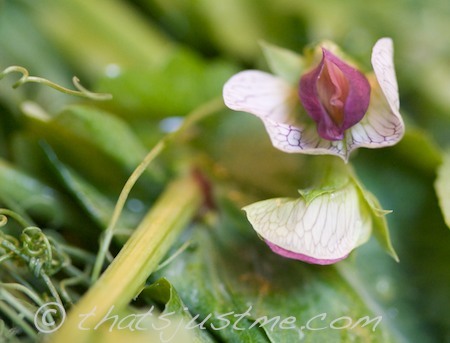 The pea tendrils didn’t have very many blossoms this time, but they seemed hardier and fresher than the spring batches, with lots of leaves and stalks. 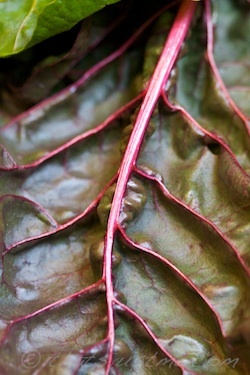 beets (or choice of turnips or radishes), bok choy, chard or arugula or pea tendrils(? 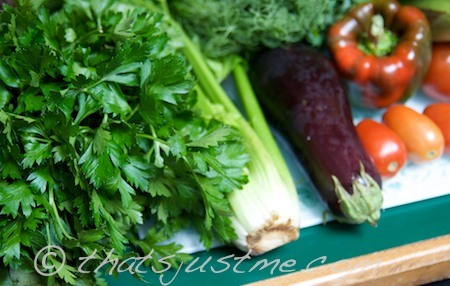 ), kale, chives (or choice of parsley), (2) plum tomatoes, 1 onion, green beans, eggplant, 1/2 pint mixed cherry grape tomatoes, aji dulce or jalapeno peppers as much as you can use. a lot of goodies this week! I was psyched at the cool choices this week. Potatoes and broccoli are exciting! 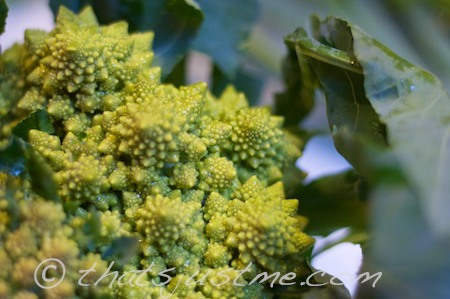 Romanesco is a little bit broccoli and a little bit cauliflower…but 100% delicious and such a treat to look at! Unfortunately, I do not plan on joining the CSA for 2012, and it has nothing to do with Farmer Dave’s, or the quality and price of the CSA. I simply decided that it was just too much pressure, especially in the summer months. It was just too overwhelming to process, cook and eat all the vegetables we were receiving. 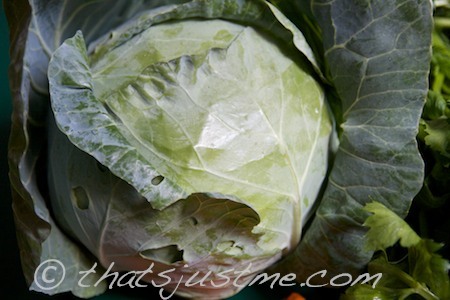 I just couldn’t keep up with cooking ideas, and I felt like I was missing out on other vegetables that I was craving (like broccoli) but couldn’t buy because we already had so much food from the CSA. So next season, I’ll continue to support and shop at Farmer Dave’s farm stand but also venture out to other farms and farmer’s markets. I’m excited that I’ll be able to choose exactly the vegetables I want, and it’ll be easier to plan my menus, especially when we’re on vacation. It will be so helpful to shop earlier in the day if needed, which will give me more time to organize and process my produce before I needed to start dinner. I also hope this will help with maintaining a grocery budget and meal plans, since I can purchase exactly what I need in smaller or larger quantities. I’ll play it by ear, and see how it goes, who knows I might miss it so much, I’ll go back the following season, or I might decide to sign up for their late fall CSA share. We’ll see. 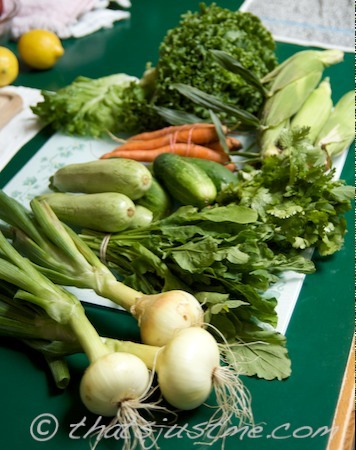 I want to make it clear that I do not regret participating in the past two CSA seasons; I learned about many amazing new foods, and learned how to prepare them. For this reason and many others, I do not want to dissuade anyone from joining a CSA. To those that want to try a CSA in the Eastern Massachusetts area, I highly recommend Farmer Dave’s! They have many pick-up locations and it’s a great bargain for all the food you receive. PLUS, you are supporting a local farm!